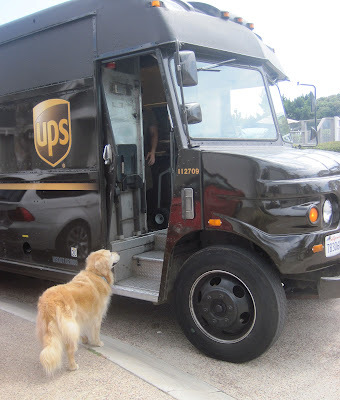 Mom shops online, so delivery trucks come to our door fairly often. I was never really interested except when they gave me cookies. However, ever since I got my Royal Mail package I realized that deliveries with my name on it make me very happy. So I asked Mom if I could order online too. She said I will need my own credit card. Seriously Mom? Today is Frankenstein Day in honor of author Mary Wollenstone Shelley who was born on August 30,1797. She wrote the book "Frankenstein "in 1818. It got me to thinking. 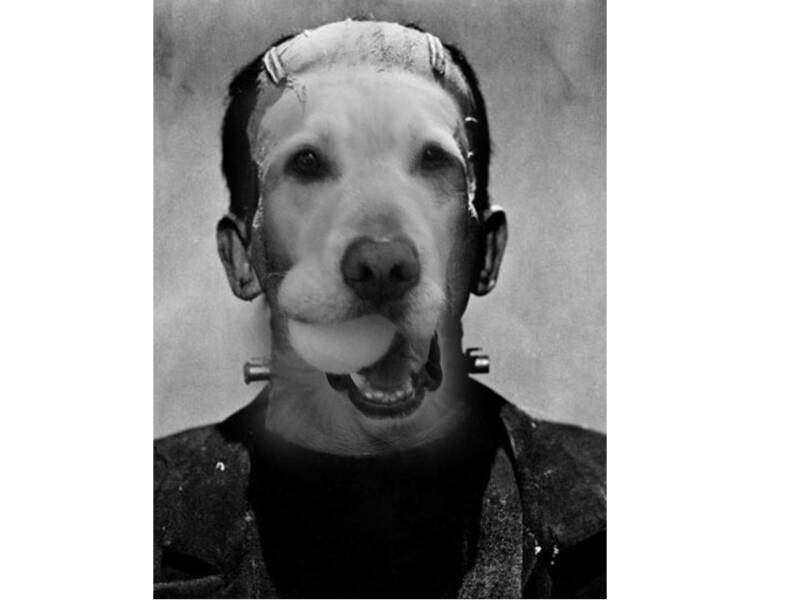 What if Dr. Frankenstein' had created me? I guess then I would have been called Frankenbear . We are so happy. Hannah and Sadie are back for awhile! . As I told you last year, Sadie is Rosy's Maxi-me. Hannah is very beautiful. In fact, I do admit I used to have a major crush on her, and I think I still do. But she lives in Arizona, and I just don't think I can deal with a long distance relationship. ﻿Rosy has been practicing fly ball. Instead of just running after it and picking it up, she wants to catch it in the air. So Mom bounces it and while it is in the air, Rosy barks at it telling it to land in her mouth. I am pretty impressed. The ball is actually starting to listen! . I always love watching the pelicans and seagulls fly over my head in formation, especially when they form an arrow shape. So the other day at the beach when I saw this pack of Goldens, I ran out of the water and got into place to create an Golden Arrow formation! However, the big guy in front, Houston, pointed out we were facing the wrong direction. Ugh. Such a nitpicker. 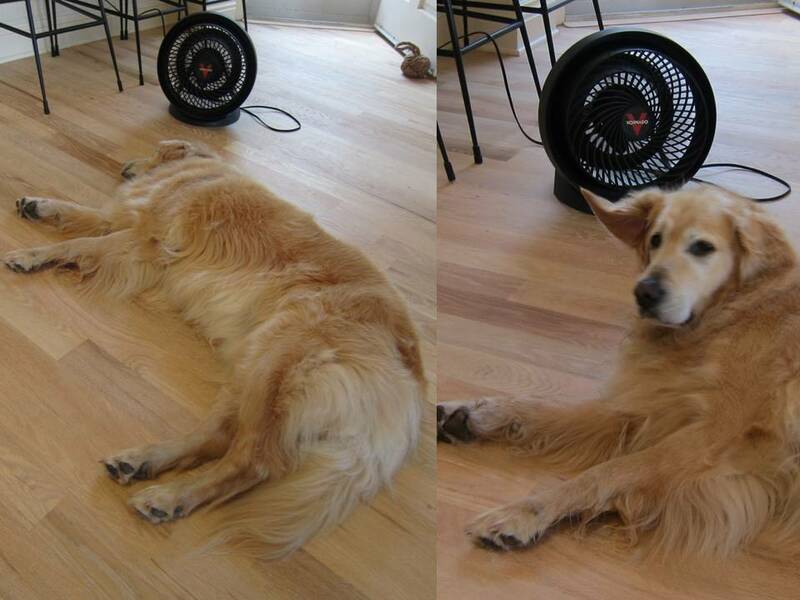 On a hot summer day after my walk and breakfast, there is nothing better than a long nap infront of the fan. However, there is nothing worse than being woken up from that long nap. Please. have some consideration ! Sometimes after I get out of the ocean, my skin and fur feel pretty gross. I have lots of sand stuck to me and even some seaweed remnants. 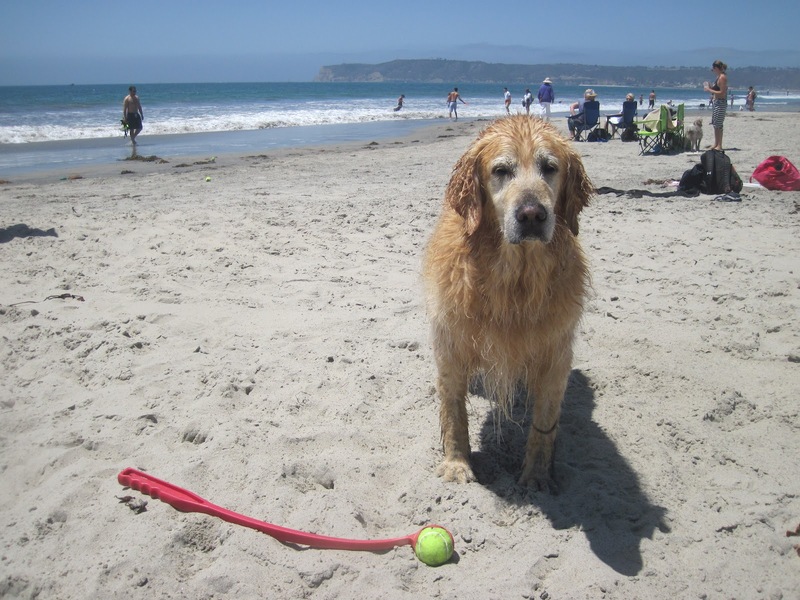 Mom and Dad think it is so cool that Coronado Beach has a place to hose me down. That way I am all clean before I jump in the car for the ride home. Personally, the fresh water feels good, but a showering in public is a bit embarrassing. Remember I told you that Coronado Beach had glittering minerals in sand? It looks like gold! So the other day at the beach I met Lola. She said she couldn't play with me because she had to dig. And she started digging obsessively and wouldn't stop. I decided she must be a gold digger. I don't think that is the kind of girl I want to be with anyway. 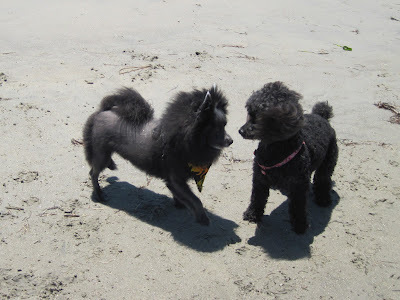 When we went to the beach the other day, Rosy saw these two Standard Poodles. 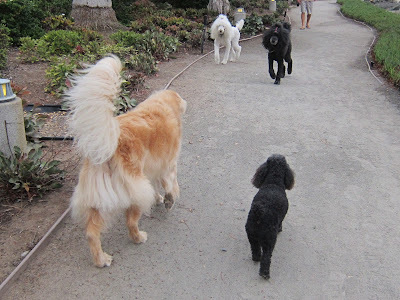 She is always interested in meeting other poodles since she thinks they must be her cousins. But I watched and felt so bad for her. They totally brushed her off. I told her they were jealous and intimidated because she is so beautiful. She agreed. I really need to teach her some humility. I am a bit bummed. 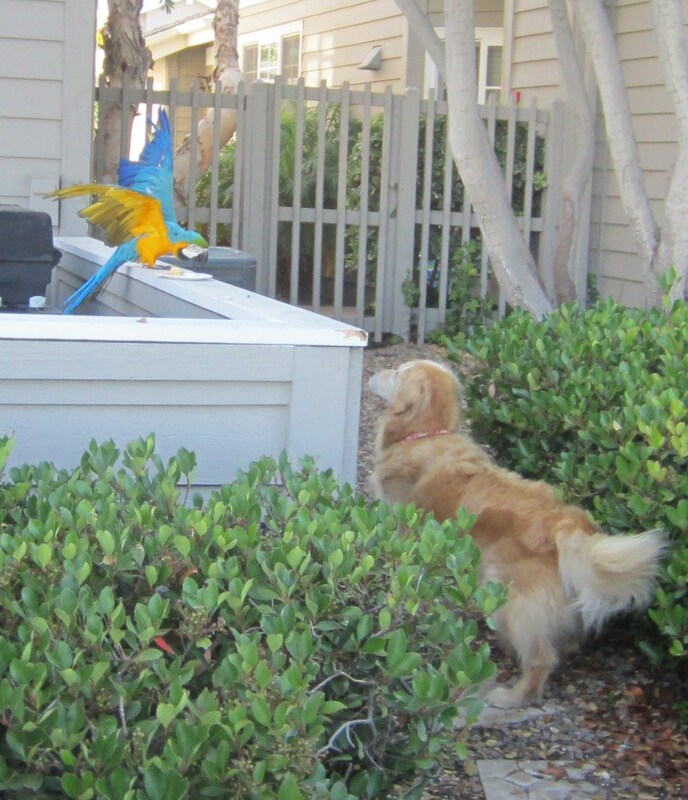 The other day, Oscar, my bird neighbor called me over. He told me that he was moving. He said it has been nice knowing me. I wish he could fly back and visit me but his wings are clipped. That got me to thinking.. I wonder if I could unclip them for him before he leaves. Anyone have a pair of unclippers? 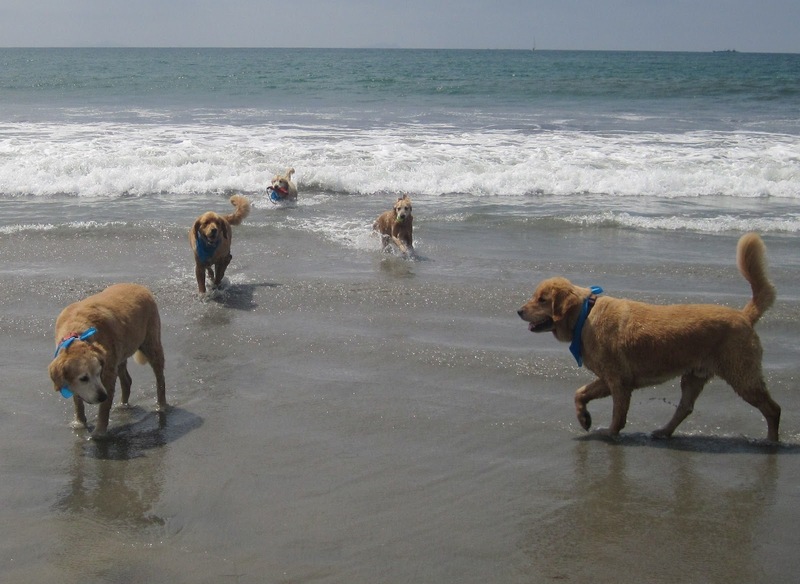 The other day at the beach, Rosy met Jax. She really liked him. She just wasn't sure whether he was a dog or a miniature lion. So she tested him by barking. 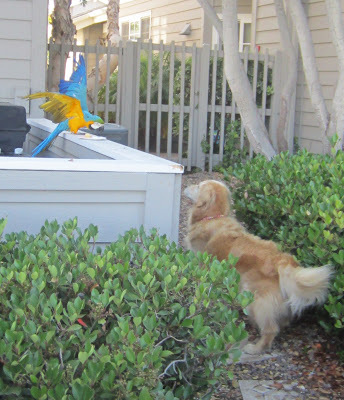 He barked back. She was relieved he didn't roar. The worst part of going to the beach is when we have to leave. 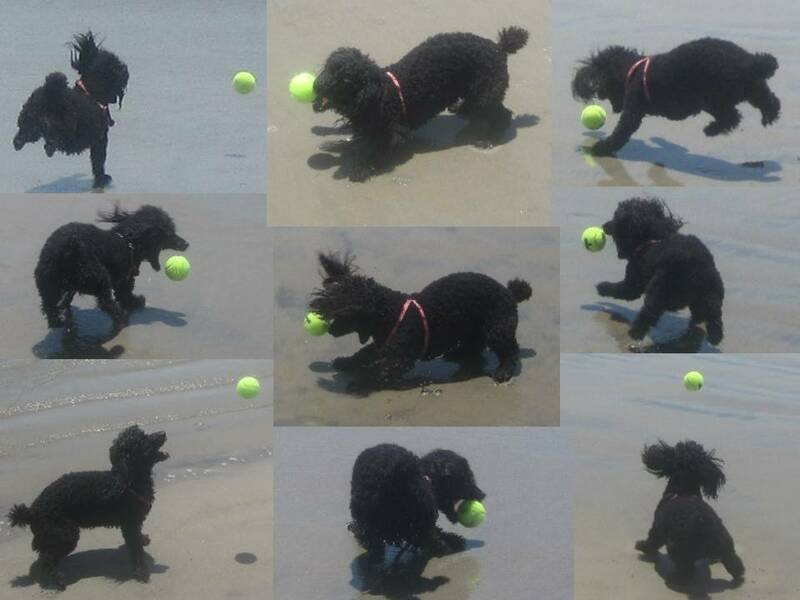 After about an hour of ocean ball fetch, Dad declares that I am toast and puts down the chuck-it . At that point I look at Mom with my "please" face. So Mom says 5 more minutes. 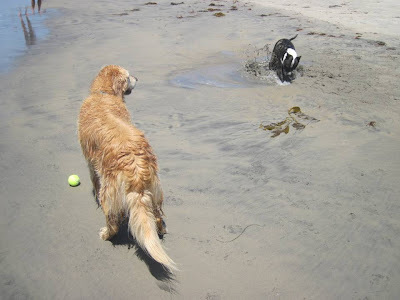 I get all excited and run back to the water. And then after 5 minutes it happens again. But my please face doesn't work. I really need to practice my please face to get at least 10 more minutes. Horses must be taking the same walks I do cause I keep seeing horsepoop on the path. So the other day I thought I would smell it. It smelled so interesting that I decided to taste it. Yum! What a delicacy ! Of course this freaked out Mom so I am not allowed to have it again. Oh well. Now I know how my Dad feels about not being allowed to eat Fois Gras (it's banned in California). Another activity on my girls weekend was shopping for make-up. We went to the Bobbie Brown counter at Nordstrom's. I sat on Mom's lap and watched (and napped) while the nice lady made Mom look all pretty. It would have been my turn next but I decided I shouldnt waste my time or money on make-up. After all, I am a natural beauty. During my girls weekend, we stopped at a famous landmark - Pink's!. Pink's is unlike any other hot dog stand in America. It has been in the same location since 1939. Always long lines, they serve over 2000 hot dogs a day! They're known for the best chili dogs anywhere, but they have more than 20 types of hot dogs! Signed celeb patron photos line the walls. 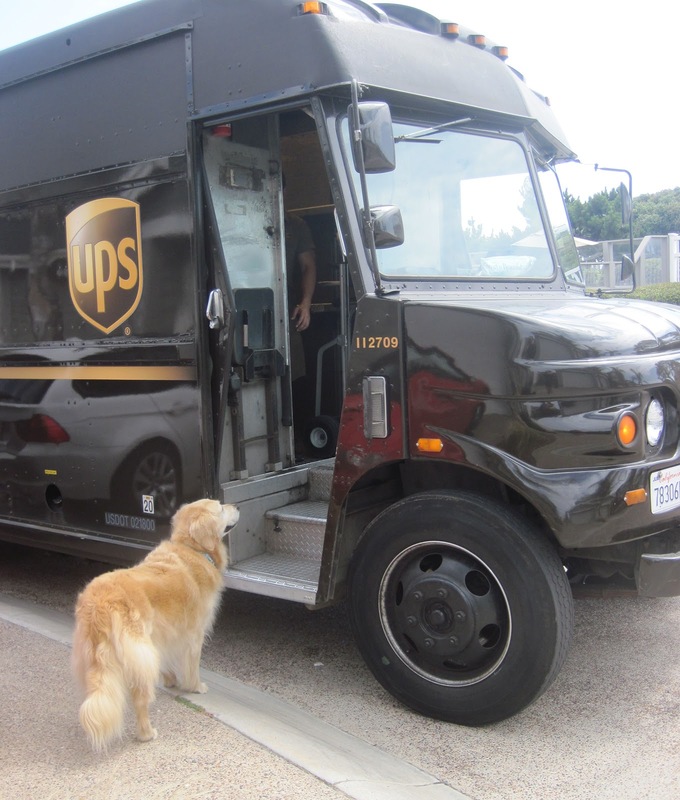 I wonder why they didn't ask me for a photo and pawtograph. 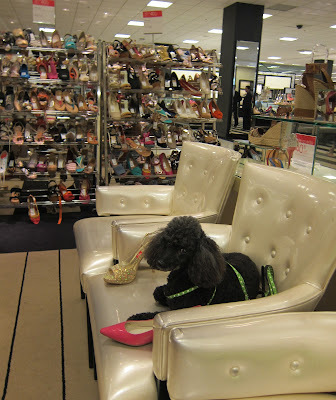 On my first day of Girls Weekend in Los Angeles, we went shopping for shoes. I chose two beautiful pairs-pink and sparkly gold. However they didn't have them in my size. Last year's shopping in Beverly Hills was much more successful. I guess I am not a Valley Girl. Rosy is going to Los Angeles this weekend to visit Sydne and Bunnybell. She asked me to help her pack. I told Rosy she is bringing way too much for 3 days. She said she is just bringing essentials for a girls weekend. - a housegift of wine, pink blankets, a party dress, raincoat, hat,, assorted harnesses and leashes, kibble, chicken soup, treats, her fave toys, her pink bag and her tiara. I just don't get girls.